Chelsea manager Maurizio Sarri has to steady the ship at Chelsea before it sinks. Football sometimes can be bittersweet, it has its ups and downs... We all love the game because it is unpredictable and exciting, but like every other fun thing in life, there is always a business angle. Chelsea football club is currently in transition, they have been in transition for about 3 years now with the Russian billionaire Abrahamovic as the owner. 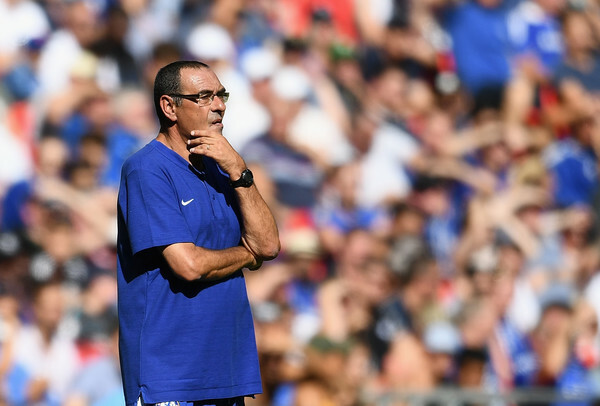 The Stamford bridge side recruited former Napoli coach Maurizio Sarri to lead them into the new season after the sacking of Antonio Conte who had issues with the hierarchy and the top players at the club. One of the obvious reasons for this decision was Conte's style was too defensive and his off the field rules and regulations were too strict for some of the top players at the club, the former Juventus manager is an authoritarian as we all know. The love story between Chelsea and Conte came to a sad ending despite winning the Premier League in his first season and a FA Cup title in his last season at the club. Chelsea have been successful since Abrahamovic took over in 2003 and the fans should be grateful for having an ambitious owner leading them, the London club have won 15 major trophies in his 15 years at the club. Though, the Russian billionaire wants to see his team play exciting football just like Barcelona did under Pep. In fact, he tried to bring Guardiola to Chelsea but the former Bayern Munich manager opted for Manchester City where he has settled, assembling one of the best Premier League teams. In his quest for this "exciting football" he craves, Maurizio Sarri was appointed to change the philosophy of the club and bring his entertaining passing game his Napoli side played despite not winning any trophies throughout his managerial career, a rare case at Chelsea, a club where they have always gone for coaches with laurels to their name. Sarri's reign started to the excitement of Chelsea fans, tagging his style sarri-ball, most were happy at the prospects of watching the team play beautiful football as videos of his brilliant Napoli side was all over social media, they got rid of their "stubborn" manager in Conte just the way they got rid of Mourinho but Chelsea forgot that they have spoilt fans who are used to winning trophies. Chelsea's popularity grew due to their winning mentality despite the odds, and at a time the Premier League and Social media (Facebook and Twitter) became so popular, younger football fans who dominated the internet got to know Chelsea as a Premier League great during the last 15 years and got used to consistent trophy winning. Now the dilemma is if their fans would be patient and sacrifice winning trophies at all cost for playing entertaining football and struggling for a couple of years before they become a European giant again. There was a meltdown last weekend after Chelsea lost 2-0 at the Emirates, they were blown away by Arsenal who looked more determined to win and close the gap on the top four. Chelsea manager Maurizio Sarri gave an explosive presser after the match, calling saying his players lacked motivation, a problem he has been hinting at in previous weeks. There have been different opinions on this outburst by pundits and fans all over social media, the problem for Sarri is this could lead to a total breakdown at the club or motivate the players - this is where player power comes into play. Chelsea have sacked two previous managers in their first season, Luis Felipe Scolari (2008–2009) and Andre-Villas Boas (2011–2012) who were both employed by Abrahamovic to give him the type of football he craves, the Russian billionaire lost patience in the system both were trying to build, so Sarri is not safe as the man at the top could pull the plug anytime he wants. At some point in 2012, Chelsea had the best young talents in World football, players like Kevin De Bruyne, Mo Salah, Eden Hazard, Romelu Lukaku, Oscar, Mata etc on their books. It was a great idea to have the best academy and buy all the best young players available in Europe as the football market is getting bigger and crazier, investors were beginning to see the potential in the sport. Emenalo, the technical director at the club, was portrayed as the villain at the club, but he back then did a good job scouting all these players and convincing them to join the Chelsea project. But there was a disconnect in the structure at Chelsea between the first team and youth team, this was due to Abrahamovic desperation of continuous silverware at Stamford Bridge. In 2013, Chelsea announced Jose Mourinho for his second spell at the club. Emenalo reportedly offered to terminate to resign to pave way for the return of Mourinho, but Abrahamovic immediately rejected the offer. The Portuguese coach is known for his willingness to win at all cost, arguably one of the best managers in the World, Jose's ideas is against all Abrahamovic wanted in the identity of his team, but the Chelsea owner was keen on winning the title again. Mourinho sold and loaned out some of these young talents, changed how some of them play like Oscar's attacking instinct was limited as Jose made him run more and play as a box to box midfielder, more like a workhorse. This was a drastic change to what the board were trying to build, but who cares? After finishing second to the latest Premier League billionaires, Manchester City in the 2013-14 season, Mourinho won the title in the 2014-15 season banishing any focus on beautiful football by Abrahamovic. Jose Mourinho lost it at Chelsea in the following season and suddenly they remember that they were building a team that can play beautiful football, so Mourinho was sacked by Chelsea for the second time in December 2015. Now back to square one, Chelsea have to buy new players that can play what the owner really wants. Now, this is where the problems started at Chelsea - the Premier League and football, in general, has grown so much in that period, social media is driving engagements, there is more awareness about football. Cristiano Ronaldo and Messi have grown into the biggest brands on social media, Cooperate bodies are investing more in individual players and clubs by signing lucrative deals with them based on social media and adverts. Players and agents can influence fans' decision by driving conversations, players are powerful more than ever and negotiations with agents got trickier. Clubs have to be careful on how they treat their best players because sponsors need the most influential and popular players on social media to be a regular figure in their team, there are data and analytics to check who is influential. New emerging managers like Guardiola and Klopp changed the game with their tactics, sports science is growing and affecting the decision of managers, and the world has switched to possession football thanks to Pep Guardiola and his Barcelona team. Most people now believe there is only one way to play football, by passing it from the back, a victory for "football purist". There is the financial fair play problem as the Arab investors at Manchester City and PSG are ready to break the bank at will, top players are beginning to demand more, agents are getting greedy, the football market just got crazy suddenly. Maybe Emenalo was right to submit a resignation offer when Mourinho was reappointed, though Emenalo finally walked early 2018 despite a plea by Abrahamovic to change his mind. The Nigerian is currently the new Sports director at French Ligue 1 Club Monaco. Like every other business, the owner has to start making profit, Chelsea needed to downsize on their spending suddenly and balance the books as they have to build a new stadium or expand the current one, it became the conversation for a while as they try to sort that out, Abrahamovic would have to cough out a fresh £1billion to expand Stamford bridge to 60,000 capacity so as to generate more revenue on match days. Oh well, this article is not about football business and economics. Some Chelsea fans do not care, they still want their club to break the bank for the best players and continue to win but one should understand that football is entertainment and business. If Chelsea had not sold off the likes of De Bruyne and Salah back then maybe they would have had one of the best teams at the moment and play the attacking football their owner craves. Now they have a coach who is highly rated by his colleagues in the game and plays the style their owner wants but he is currently struggling, a situation that should be expected in his first season in England. Sarri can be stubborn, he needs time to learn the difference between handling big egos at a club like Chelsea where you are always under pressure to win and a club like Napoli. The fans need to be easy on the players as well, especially on Jorginho who was bought to help Sarri on easy execution of his ideas on the pitch. But he is now the scapegoat for the poor performances. The Stamford bridge side need Jorginho to be at his best mentally and physically, Sarri does not look like a coach who would change his tactics or team selection just like that. His style needs a player like Jorginho, it is expected to be hard for the Italian midfielder to cope with the physicality of the Premier League. The demands at a Club at Chelsea can be overwhelming, and despite all his technicality, Jorginho needs time to adjust. Chelsea will play Tottenham in the second leg of the Carabao cup semi-final match on Thursday, a match they need to win after their 1-0 loss in the first leg away at Wembley. Sarri needs his players to turn up for the match, the Chelsea players will need all the motivation for the match as the pressure continues to mount. Maurizio Sarri has to also take some of the blame in their current struggles, he needs to drop some of the players or change something in the team. The fans and the board need to be patient and support the manager as Chelsea can't compete financially at the moment, the board has to spend wisely, hire a director of football to continue building the new Chelsea and look into the youth team and give them a chance. Switching managers frequently would only yield the same results.